Seven flavorful, crunchy layers are topped with a zesty ginger-kissed dressing. Arrange lettuce in bottom of large (3-quart) clear glass serving bowl. Discard seasoning packet from soup mix; coarsely crush noodles. 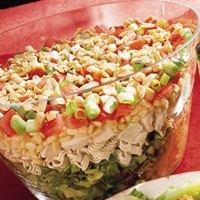 Layer noodles and all remaining salad ingredients, in order listed, over lettuce. In small jar with tight-fitting lid, combine all dressing ingredients; shake until well blended. Pour dressing over salad. Serve immediately.
" It was not good "
I can't believe my eyes at how lovely the salad looks in your picture. Unfortunately, I can't have corn niblets but maybe I could substitute sweet peas for the corn. Hmmmm, I'll let you know what I come up with. Thanks so much for this great "5" fork recipe. Wowee Mountainmama. You outdid yourself again! A ginger-kissed dressing, ha? How romantic! That is a great photo! I'll make this next summer because I think even Italians will like this. I have to go all the way to Rome or Florence to buy Raman, however! Sounds very good and something different. Love this one I have to agree with Marky Beautiful and light...LOVE it..Five Forks! Do you cook the noodles? Are there any added noodles in it?? 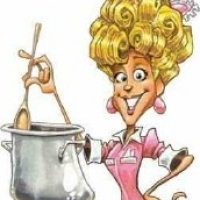 Like mountainmama's recipes? Never miss an upload!